This year, the Scottish Women’s Institute centenary is being celebrated all over the country. The Stirling Smith is exhibiting the work of the Stirling, Clackmannan and /West Perthshire Federation of the SWI, and the 175 works on show have been the subject of much comment and admiration. In the exhibition, and joining the permanent collections of the Stirling Smith Art Gallery and Museum is a colourful table cloth, intricately stitched by the members of the former Strathendrick Group of the then Scottish Women’s Rural Institute in 1958. The groups which made up Strathendrick were the Arnprior, Balfron, Buchanan, Buchlyvie, Drymen, Kippen and Gargunnock guilds. Each Guild chose a pictorial symbol for their area to be stitched on the cloth. The threads were bought from the Royal School of Needlework, London. The linen cloth was sourced in Glasgow and sewn by many hands. 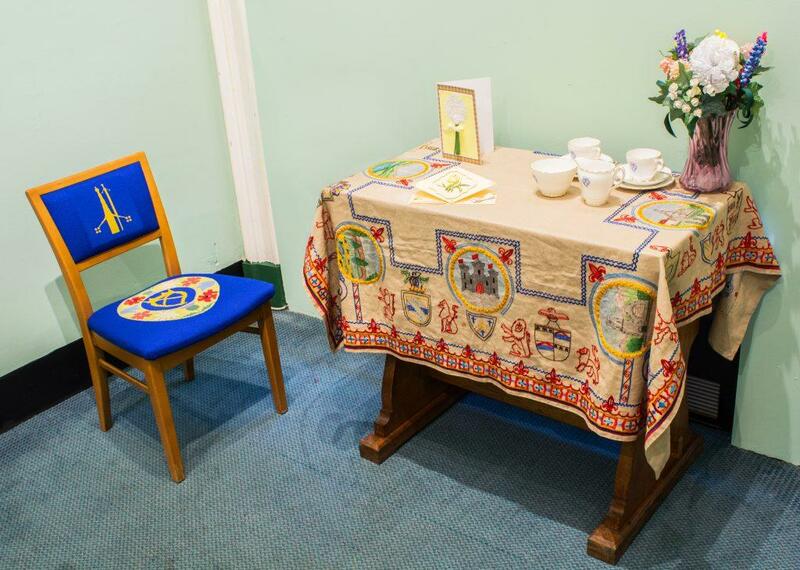 The cloth took First Prize at the SWRI Guilds Show in the Albert Halls in 1958 and is still bright after 60 years’ service at monthly meetings. The papercraft flowers on the table are the work of Jennifer Carruthers and the tapestry chair beside it was stitched by Elizabeth Jamieson in 1976. Every Saturday from 12 – 2pm an SWI member will be with the exhibition, demonstrating an aspect of their craft, and answering any questions.